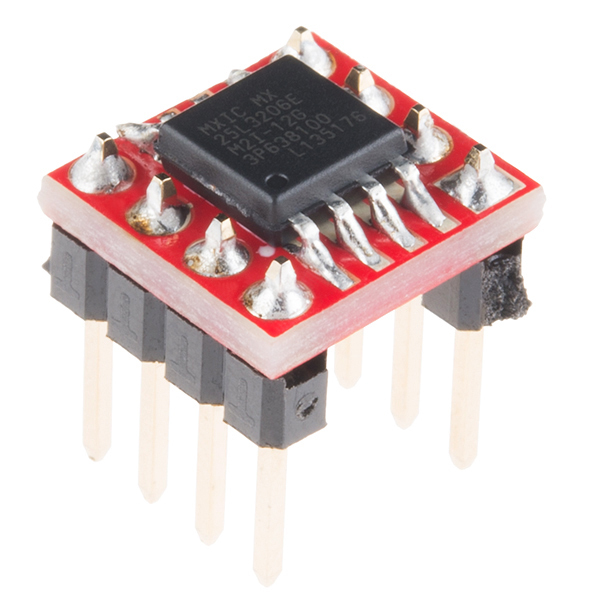 The SparkFun 8-Pin SOIC to DIP Adapter is a small PCB that lets you adapt SOIC packages into a DIP footprint. 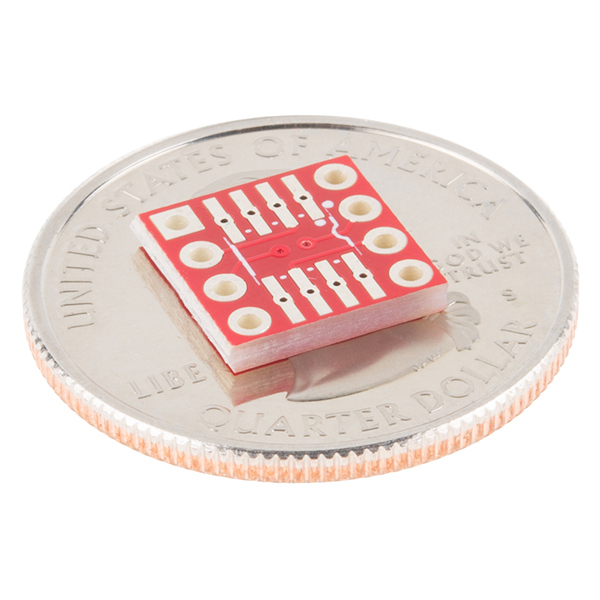 These tiny boards are useful for modding and upgrading devices that use 8-pin DIP ICs, when the upgraded IC is only available in a SOIC footprint. 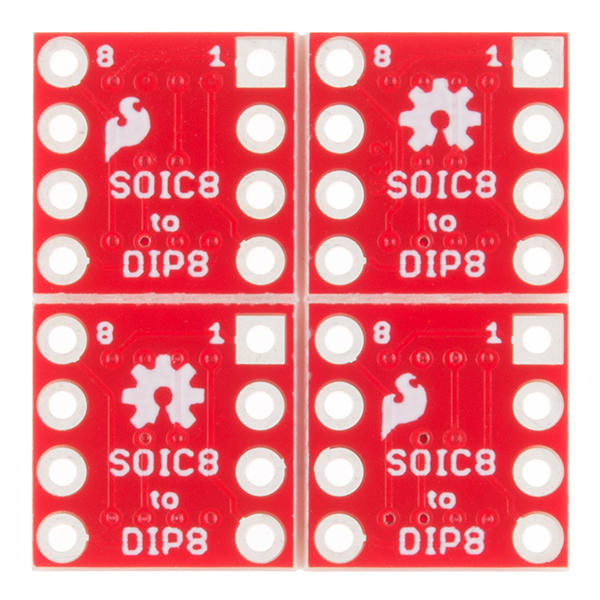 You can also use these adapters for prototyping by making SOIC packages compatible with solderless breadboards. 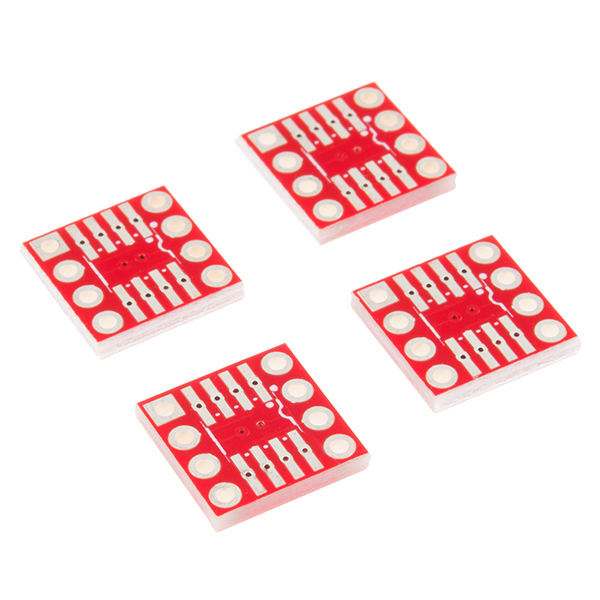 This version of the SparkFun SOIC to DIP Adapter adapter comes as a small array of four boards. We did this because if you’re adapting one chip, you are more than likely to adapt another. The PCBs easily snap apart from each other, thanks to two crossing v-scored lines. The full dimensions for this board are available through the GitHub repo. Very high quality board. Very Easy to snap apart. Very easy to solder ! Recommend machine pin interface. I've tried others but this SparkFun Dip adapter is the best ! Was prototyping with a LM4881 chip, and this was just the ticket to help breadboard that amp chip. Perfect! 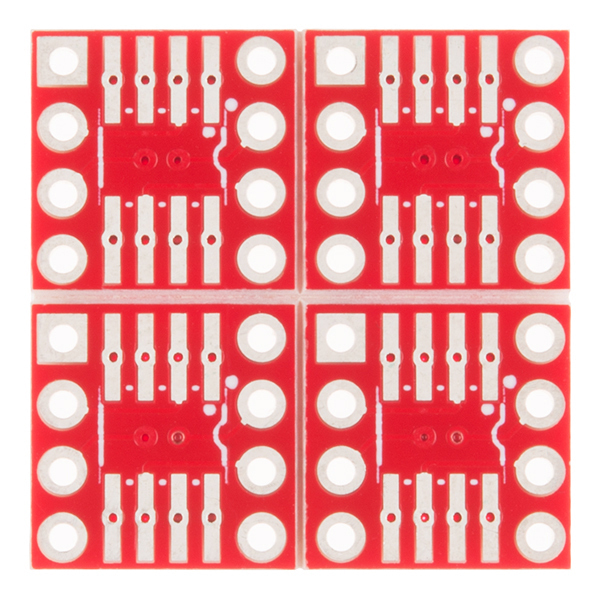 These templates are too wide for SOIC-8. Do not use for narrow profile. These little boards have so far worked perfectly for letting me use some interesting SOIC-8 chips even though I don't have a reflow oven. I especially like the vias in the center of the pads. They really help contain excess solder so you don't form junctions when soldering by hand. Great design and implementation! 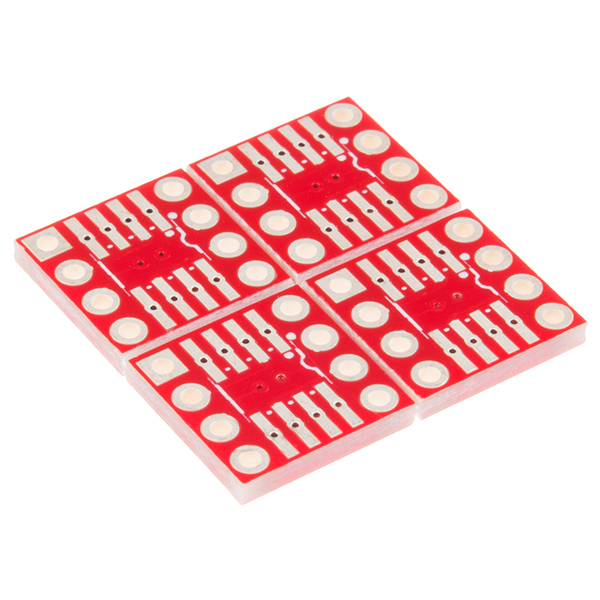 Easy to use and allows for breadboard testing. I'm not great with soldering small SOIC devices yet but even I was able to work just fine with this adapter. Nice board. But several weeks for delivery. Arrived too late for me to use it in my Maker Faire (NY 2017) project. Used to McMaster Carr's overnight deliveries ....this was not the case with Sparkfun. So some of the fun went missing. I am upgrading my fender frontman 15r, one of the things I am doing is replacing the op amps on the circuit board. All the dual op amps were eight pin dips. So first I removed the old op amps, and installed dip sockets so I could try out different op amps seeing which set I would like the most. Some of the more high end op amps don't have a dip package, sparkfun was the first place that showed up as having the adapter PCB. They work like a charm.